Let me give you the back story here. My husband and I have a friend who has land on a river in Middle Tennessee. 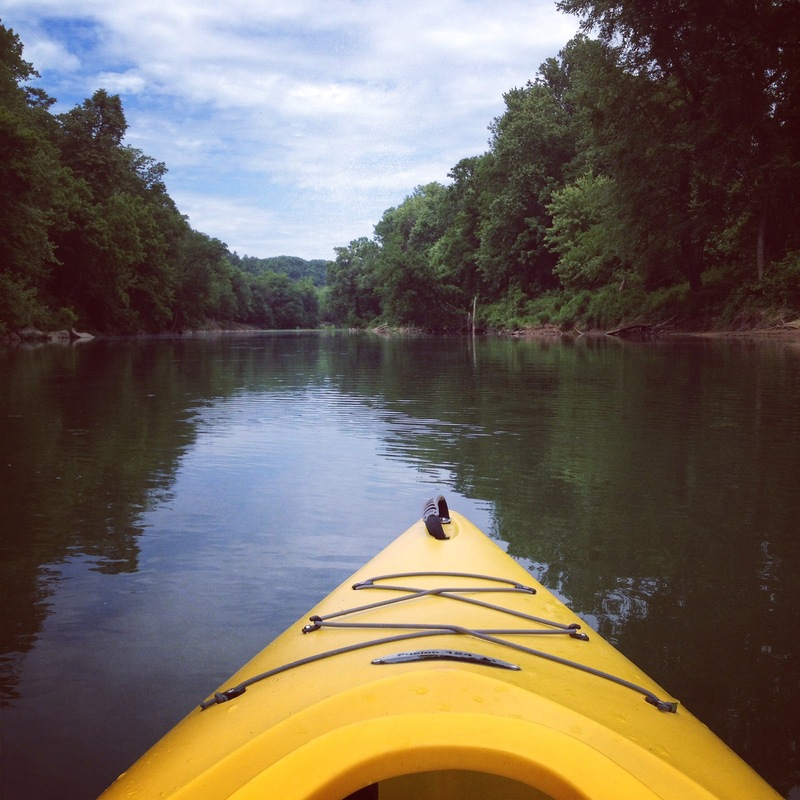 We love going to ‘The River’ to unplug, camp, and kayak. The portion of the river that we visit is small-ish and relatively calm as far as kayaking rivers go. There are even peaceful portions where I can stop paddling and just float while taking in the beauty of nature. Aaahhh, it recharges me in so many ways. Last summer, with our new kayaks, we set out on the river and I was feeling a bit too confident. I had floated this river multiple times, I had a low center of gravity in the kayak, it was a beautiful day…what could possibly go wrong? I got into the water with the attitude of ‘I got this-no problem!’ and something that may have been along the lines of ‘This is my river!’. The float was going well and there were 5 of us enjoying the peace and beauty when we came upon a turn with a downed tree. There was also a much stronger current here and it was deeper than some other areas of the river. This downed tree was one that had 2 trunks that had grown up out of one. One side of the tree was submerged and one was protruding out of the water. I took the turn too wide and was swept into the tree. As that happened, my kayak flipped and began to fill with water. I couldn’t right the kayak and I couldn’t stay in it, so I slipped out and as I did, the kayak went underwater and between the 2 trunks. The current now had me pinned against the trees as it pressed against my back. Luckily, I could stand up, but I couldn’t move as the water was stronger than I was. My husband pulled his kayak to the bank and washed over to me to help me get off of the tree and down the river. Our friends were gathering things from my kayak like my seat, the wetbox, and my cooler as they floated down. And the guys went back into the strong current to push my kayak through and free from the tree. Once it was over, we sat down for a moment to catch our breath and I recognized that the river was teaching me some respect. And reminding me that I am not in control as much as I like to pretend that I am. I was definitely scared for a moment and grateful that it turned out as well as it did. I haven’t forgotten the lessons from that day. Since then, I have seen how my ego gets in the way when I think I can “coast” through. How the quality of my work suffers and things fling out of control when (as we say in the south) I get too big for my britches. How every time I think I am so “smart” I don’t need to prepare, a curve ball comes flying at me and I have duck back into line. So, I do my best to stay humble. To be present. To respect forces that are bigger than I as well as my lack of control on the world around me. The second training at that conference did go very well, but I also mindfully prepped, focused, and thanked the Universe for the opportunity to do what I love. Remember, the only thing you can really control is you. And when you go into anything with the intention to do your best and to respect what others have to offer you- whether the others are trainees, coworkers, Mother Nature, or your kids- you will be successful. I have a hard head, so sometimes my lessons have to come from a swift flip of the kayak. However, it was an effective way to make that lesson stick. May your experience turn out as smoothly as mine did. Perhaps you could just learn from mine and try going into things with good intention, respect for the lessons that you can learn, and an open mind. Good luck and you know I will be tryng my best right along with you.